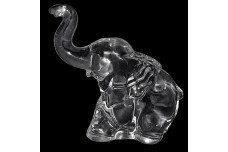 The A.H. Heisey Company - The A. H. Heisey Glass Company was established in Newark, Ohio in 1896. 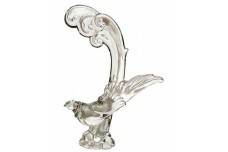 At first Heisey produced mould pressed patterns that simulated cut glass styles of the era. Table sets, cruets, small condiment jars, bowls and syrups were a large part of this production. By 1920, many of these early patterns were no longer considered stylish and Heisey was forced to join the new trend as consumer interest moved toward etched and cut patterns. 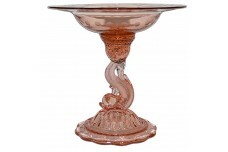 During the 1920's many glass companies began to focus on color and Heisey was no exception. 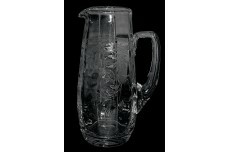 Vaseline glassware was made in the early 1920's. Later, about 1925, Moongleam (green) and Flamingo (pink) were introduced. Other distinctive colors soon followed and and the period from 1925 to 1938 was Heisey's most prolific color era. 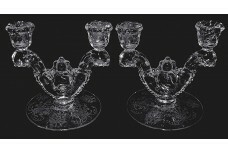 Although colored glassware was important to Heisey, crystal glassware production was Heisey's most important product. 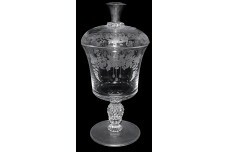 Heisey was noted for high quality handmade crystal glassware. 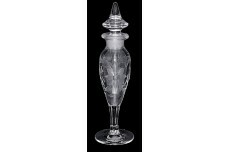 Many of the blanks were etched by either Heisey or independent glass houses. Heisey produced numerous popular etchings from the 1930's until they closed their factory in 1956. 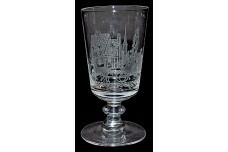 Orchid was the most popular etching among consumers and is the most popular among collectors today. 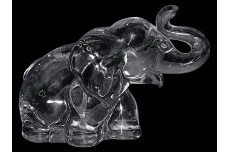 Much of Heisey's glassware was marked with their familiar "Diamond H" trademark. However, some items were only marked with a paper label. 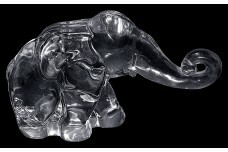 After the Heisey plant closed, many of the molds went to the Imperial Glass Company. Imperial produced numerous items from these mouds. 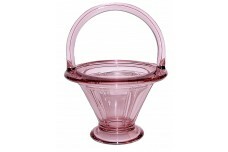 Some Imperial items were made impressed with the Heisey trademark. 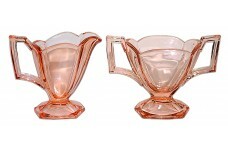 Heisey Flamingo #354 Colonial / Flat Panel Hotel Sugar and Creamer - SUPER NICE!